Global Paint Rollers Market size was valued at over USD 2.5 billion in 2017 and is expected to witness significant gains at around 6% from 2018 to 2025. 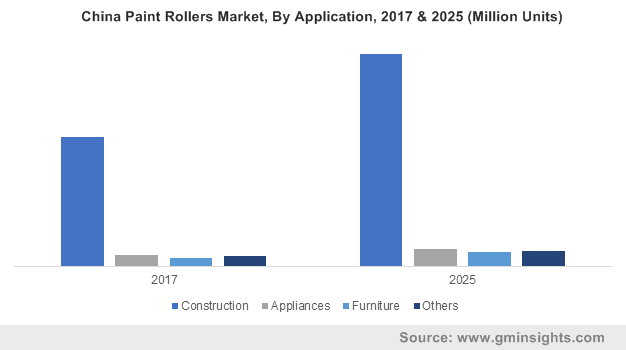 Increasing structural reforms plans coupled with shift in consumer preference towards standardized painting are driving the paint rollers market share. The recovery of the major economies from recessionary pressure has led to the resurgence of the residential and commercial construction sector augmenting the product demand. For instance, according to the U.S. Census Bureau, the construction spending in the U.S. will surpass USD 1.5 trillion by 2020 due to increasing business confidence post-recession. Furthermore, the shift in consumer preference toward eye-catching interiors, particularly in the residential sector will positively influences the product demand over the forecast timeline. The paint rollers industry is traditionally observed as labor-intensive. It presents the predominance of small & medium-sized enterprises along with low & high-volume producers. The industry has a very fragmented and complex supply chain network with multiple stages that are often outsourced. A common drift of the growing degree of the business openness is observed over the past decade. However, differences in the extent of market openness in various nationalities still exist. Factors including the paint & coating industry trends, structural conditions, and competitive landscape of manufacturers located in every country are anticipated to influence the paint rollers market size from 2018 to 2025. Manufacturers are continuously focusing on product development and visibility by offering their product through online portals and uploading their catalogs on web portals. Features, such as cost-effective, high-quality, environment-friendly, lightweight, swift-paint applicability, easy-usability features, and advancements, in the production facilities are the key trends followed by the industry players. Moreover, the key manufacturers are investing heavily in capacity expansion and hiring industry specialists to gain competitive edge. Lack of skilled labor in the construction sector will present a significant challenge for the industry. The financial crisis of 2008 to 2013 resulted in the unemployment of several laborers engaged in the construction industry which led them to seek opportunities in other sectors. This had a significant impact on the paint & coatings workforce, causing a significant loss of experience, skills, and availability, directly affecting the cost of labor and projects, and prolonging the time duration allotted for the project completion. However, major players in the industry are able to attract employees through better salaries, benefits, and job security. Also, the recognition to increase efforts on developing labor skills taken by companies & other agencies is expected to assist industry participants in overcoming the limitations over the forecast timeline. Woven type accounted for around 45% of the paint rollers market share in 2017 and is predicted to gain significant market share by 2025. Superior features provided by the product including protection, drainage, filtration, separation and reinforcement has augmented the demand. The product is mainly preferred for gloss and semi-gloss finishes. A fine blend of woven fabrics provides a superior protection against shedding and offer lint-free finish on semi-rough, smooth, and semi-smooth surfaces with all enamels, paints, and varnishes. Synthetic rollers are used in both knitted as well as woven fabric categories. Usually, polyester, nylon, or a combination of both is used. The quality levels can vary considerably within this category from high-end to low-end economy models that are designed based on end use applications. Global paint rollers market from blended fabric was over 150 million units in 2017 and is expected grow at 6% from 2018 to 2025. The segment provides unique properties as they are manufactured utilizing two or more distinct kinds of fibres to serve specific needs in paint application. Synthetic fabrics are extensively used in painting roller market owing to high durability, versatility, and cost-effectiveness. They are used with quartz as well as water-based paints on a variety of external and internal surfaces. Shorter pile depth accounted for 25% of the paint rollers market share in 2017. The product enables the reach of paint in hard-to-reach areas due to its size. It is more suited for smooth surface applications and a depth range between 1/8" - 1/4" is recommended. Shorter pile paint rollers have gained a significant demand owing to its excellent paint pick-up property, coverage, and the ability to provide a smooth and flat finish. Construction held the largest share in the application for paint rollers market and is expected to surpass USD 3 billion by 2025. The resurgence of the residential and commercial construction sector from the recessionary pressure and increasing investor confidence are augmenting the product demand. Furthermore, the ability of rollers to speed up painting & coating tasks and decrease manpower involved will foster the paint roller market growth. Furniture and appliance market emerge as other key segment for the industry. At present, painting operations for appliances, machinery, and furniture are executed manually and involve extensive manual labor and time. The use of rollers in these industries will speed up dramatically and decrease the manpower involved, thereby augmenting the segment demand. Asia Pacific accounted for 55% of the market share in 2017 and is projected to grow at a steady pace over the forecast timeline. China, Japan, and India are the major countries contributing to the regional. A host of favorable factors such as the abundance of a low-cost & highly-skilled workforce and the expansion of the hospitality & real estate sectors will stimulate product demand. Moreover, the industry participants are shifting their production facilities in the region which will act as a catalyst for market growth. Europe paint rollers market accounted for over USD 495 million in 2017 and is expected to observe steady growth. This can be credited to low interest rates, recovery in economic growth, and increasing business confidence. This results in increasing investments in public construction and other infrastructure to meet the needs arising from urbanization, immigration, and commercialization, thereby creating high product demand. 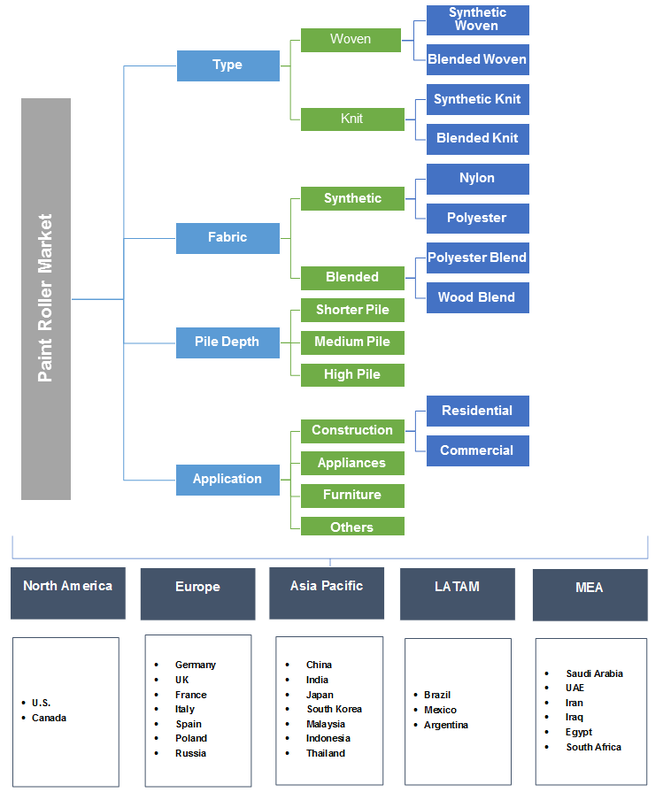 The global paint rollers industry share is highly fragmented. The market is highly competitive owing to the presence of key players, including Purdy, Linzer products Corp., Wooster, and Work Tools International. Other prominent manufacturers are Beorol, Magnolia brush, Rust-Oleum, and Stanley. Numerous companies are involved in partnerships, collaborations product innovation and portfolio expansion to enhance their industry footprint. For instance, in 2015, Purdy launched thermal bond technology winds roller covers for smooth rolling. Industry players are constantly focusing on enhancing their production facilities and upgrading their solutions to differentiate their services from competitors. For instance, Linzer products Corp. made an announcement to start a new manufacturing and distribution facility of 222,000-square-foot with an investment of USD 4 million in Georgia, U.S. The paint rollers market is traditionally observed as labor-intensive. The industry has a very fragmented and complex supply chain network with many stages that are often outsourced. A diversified product portfolio, geographic presence and the establishment of an effective distribution channel are crucial factors that enable players to sustain in the market. Consumer expectations and consumption patterns in different regions are also important factors to be considered to supplement market growth. Historical data coverage: 2013 to 2017; Growth Projections: 2018 to 2025.